Infectrol 2.45 is to be used for disinfection and sterilization of surgical instruments. Effective against bacteria, fungi, viruses and spores. Unscrew cap of attached vial and empty the entire contents into the Infectrol 2.45 solution. Shake well. Colour of the solution will change to greenish yellow. 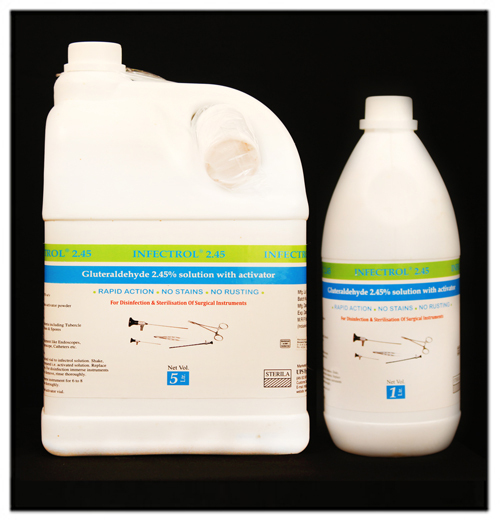 This activator powder is compatible only with Infectrol solution. Always add entire contents. Do not use part of the powder. Use and reuse now prepared, i.e. activated solution for upto 14 days. Discard solution after 14 days. For disinfection: Immerse instruments for 10 to 15 minutes and rinse thoroughly. For sterilization: Immerse instruments for 6 to 8 hours. Remove and rinse thoroughly. Useful for thermo sensitive equipment like endoscopes, bronchoscopes, laparoscopes, catheters etc.